Marrying a farmer gives me the chance to do some farming as well. Seeing as how I came from a farm background, I actually enjoy spending hours in a small tractor cab. I regularly use the word "therapeutic" when referring to tractor time. It is a wonderful time to get some quality thinking done while also being productive. An afternoon of solitude was precisely what I needed after the craziness of my move from Michigan to Texas so on my first Thursday in Texas, I spent the afternoon in the tractor running the plow. I have never been involved in the tillage process before since I was always busy in school during this time of the year, but after a one-round lesson from my awesome teacher Royce, I was good to go. For the most part, it was glorious! Just me and my dog, Rori, against the corn and cotton stalks from last year. I might have had a couple of small "oops" moments, like when I didn't quite get my GPS guidance clicked on or when I put my plow down a little too soon during my turn, but when I pulled the tractor and plow into the farmyard, they were both still in one piece. I'll call that a win for me! 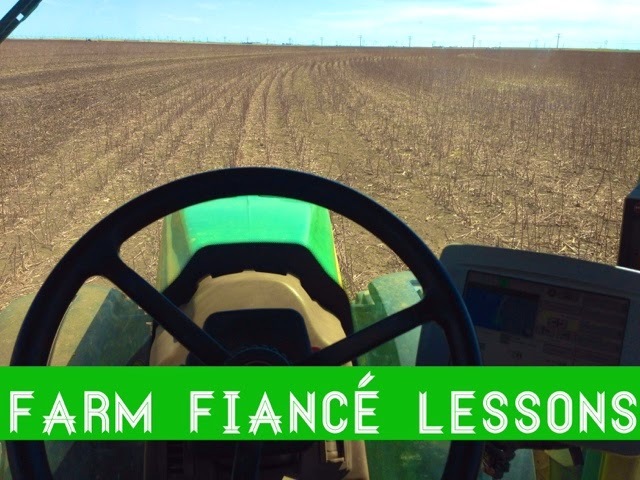 However, I learned a very valuable lesson every farmer's wife, fiance or girlfriend should know. Knowing what I know now, I got way too excited when Royce asked me to run the tractor for him. For the next week after that, he kept asking me if I could plow "for just an hour or so. "* Not saying that I didn't truly love running the tractor for the afternoon (because I did) and not saying that I won't run the tractor on the weekends (because I will), but I really like my big kid job too. Getting him to grasp the fact of me working from home has been a challenge, but he's catching on now. *Side note: Just an FYI, farmer time does not correlate to the actual clock at all. An "hour or so" ends up being at least three hours. Farmer time is a little bit like a woman's "getting ready" time. While I say, "I'll be ready in 10 minutes," what I really mean is, "I'll be ready whenever I'm ready, and that will most likely be at least 30 minutes."